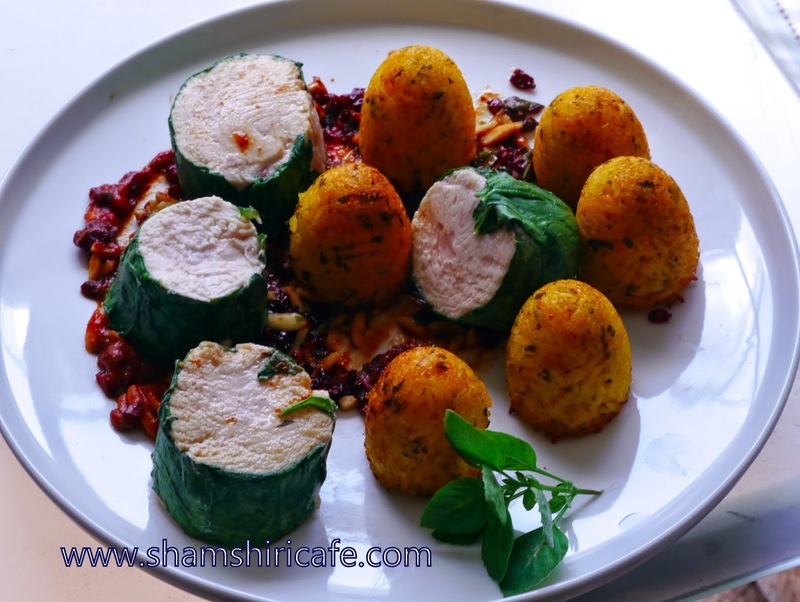 A while ago, an effort was made to make a deconstructed Persian spinach Tah-chin, in order to celebrate my blog's fifth birthday (this English post was edited a few years later). As there are no Michelin Star awarded Persian restaurants, the goal was to fantasize about such food. To do so, chicken breasts were wrapped in spinach and poached in an aromatic broth, the rice custard was cooked in silicone mold. Opinions on whether the final dish deserves Michelin Stars might differ; the poached chicken, however, turned surprisingly tender and astonishingly beautiful. The presented poaching method is the closet to a homemade sous-vide, without the trouble of having to buy the expensive equipment. Line the working surface with a large piece of plastic foil. On the foil, lay four to five rows of spinach leaves. Each individual row should also contain 4 to 5 spinach leaves. We are looking for a solid green square web of 20 to 25 spinach leaves (depending on size of the breast). The spinach leaves in a row should slightly overlap. With the flat side of a meat tenderizer, pound each breast flat. Lay the breast on the edge of the spinach square. 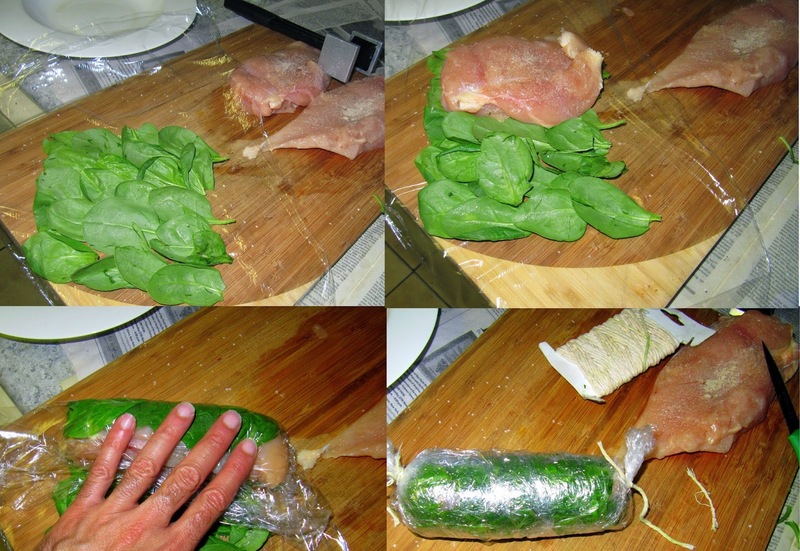 Season and roll up the breast by lifting the foil and attaching it to the breast. Make sure the spinach base is also following through and is attached to the chicken. If you do well enough, you should end up with a green-looking foil-wrapped sausage-shaped entity. Make sure the ends of the sausage entity are tightly sealed by using butcher's twine. Make a court bouillon (i.e. the poaching liquid) by combining all the rest of ingredients, listed under: "Spinach wrapped poached chicken." When the liquid comes to a rolling boil, turn off the heat (do not remove the pot from the stove). Add two of the sausage shaped entities to the liquid, cover the pan, and wait for 20~30 minutes (depending on the size of the breast). Measure the inside temperature (from one end and along the axis of the cylinder), making sure it registers 165 F (~74 C). Otherwise, re-wrap the breast, bring the liquid to a boil, turn off the heat, and cook the chicken for another couple of minutes. When done, cut it loose and remove the foil. Using a sharp knife, cut the breast into thick coins. Repeat the process for the other two chicken breasts. To make the sauce, sauté the almond and barberries in butter. Add the tomato paste and cook for another 30 seconds. Add the poaching liquid and let thicken. 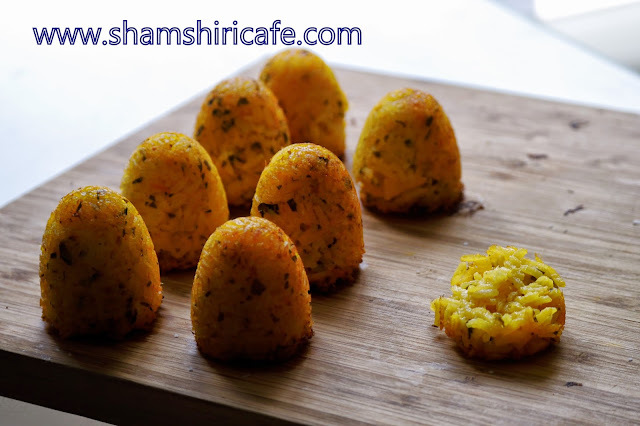 I served the dish with silicone mold baked miniature Tah-chin bites.